White-"bored"? We've got just the solution. Panasonic's UB-T780 Interactive Whiteboard will help energize your meetings, keep your students engaged and focus the attention on the topic. Complete with an abundance of interactive technologies, the UB-T780 is the tool you need to keep those ideas flowing and engage your audience. Create interactive lessons throughout the curriculum with the ability to draw, edit text, change color, enlarge, rotate, cut, copy, paste, animate, and much more! 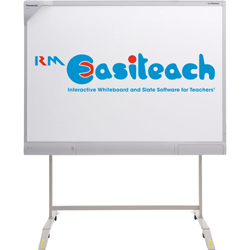 RM Easiteach includes over 2,000 images, sound & Flash files, database & spreadcheet tools, RM Easiteach Sample Starter Curriculum tools & Starter Content pack.